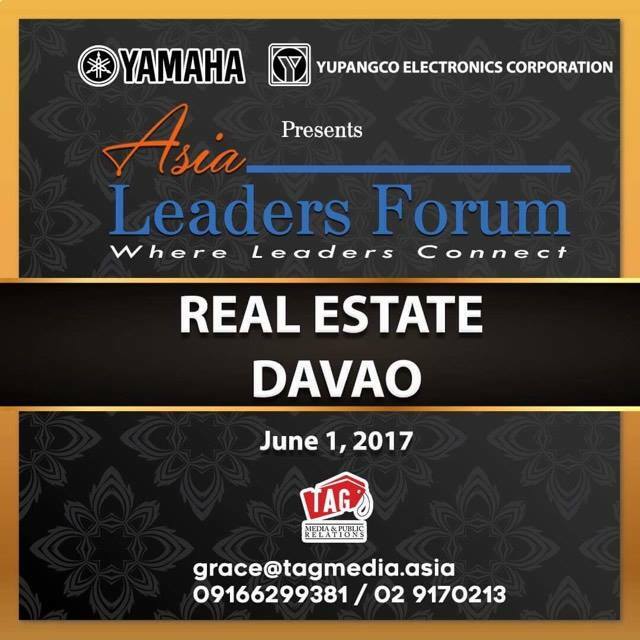 On June 1, 2017 from 10AM to 3PM, another Asia Leaders Forum in Real Estate will be launched in Davao this time with the collaboration between Yupangco Electronics Corporation (Distributor of Yamaha Sound and Audio Technology) headed by Jose Mari L. Yupangco and TAG Media and Public Relations headed by Engr. Grace Bondad Nicolas. Robert L. Yupanco is one of the country’s business tycoon, an eligible bachelor and owns one of the biggest companies in the Philippines. He is also the grandson of our former president Jose P. Laurel. Just last month, January 31, 2017 at Misono Japanese Restaurant in Makati, the first of its series for this year under Asia Leaders Forum has been launched with speakers that includes Dr. Elton Tan of E-Hotels, Robert L. Yupangco of Zoomanity Group, Engr. Ben Co of BSC Construction, Mario Berta of Flyspaces, Congressman Prospero "Butch" Pichay of Surigao Del Sur, Koo Kwan Kon of Global Morning City Development among others. Attended also by representatives from SMDC, ProFriends, DMCI, DibZ and Megaworld. The subject matter experts are trail blazers in their fields. Participation at Asia Leaders Forum will give you the competitive edge you need to beat the myriad of other real estate participants chasing deals. These experts will share with you their strategies. For this year of ASEAN 50th Anniversary and the chairmanship of President Rodrigo Roa Duterte, all eyes are focus to the Philippines as the hosting country, it's time to showcase the skills of the Filipinos and the Philippines products and services. Asia Leaders Forum is just one way to promote the backbone of any organizations and our world class infrastructures and talents. The objective of the Asia Leaders Forum is to promote the Philippines as the premier business hub in Asia and to share to participants the updates with regards to the real estate landscapes in the Philippines & beyond, technology & digital marketing and the government mandates and initiatives to improve the real estate sector in the country. For more information, please contact grace@tagmedia.asia or call 09166299381.